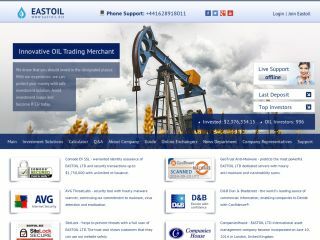 EASTOIL LTD is an international investment company specializing in oil trading that involves purchasing securities of companies engaged in oil mining. Global competition for exhausting oil deposits has begun and private companies as well as governments are increasing spends on new equipment in order to get the last profits from oil trades as oil is going to be extinct within next fifty years or so. What we do is investing in companies such as British Petroleum by buying their futures and securities and then re-selling them after a significant price increase. Sorry. We don't offer RCB for EASTOIL LTD Hyip Program Right Now.